my sister Maggie, who plays for Michigan, hit not one, but TWO BOMBS! I found these said BOMBS on You Tube. Some random put them on there. And I thank him for doing so because we were unable to make the trip this weekend. However I was still able to see them live and up close. All thanks to Mr. You Tube Man. Check them out….. Number one. What’s even more awesome, is that with this win, Michigan moves on to the Super Regionals…. aka the SWEET 16! The final 16 softball teams left playing in the country! Super Regionals will be this Thursday and Friday in Michigan. Guess who’s packing up the family again and heading up there? If you can’t join us, please watch on ESPN if you are in the mood for some stellar softball. Michigan will take on Tennessee Thursday at 6:30 pm Central Time on ESPN and again Friday at 3:30 pm Central Time on Friday on ESPNU. Let me know if you get the chance to catch the games. Look for me in the front row bleachers in right center field. I will be waving at you. Go Maggie! I'll be in prayer for your family as you travel and thanks for sharing these cool videos with us! I played sports in high school and this is the kind of things that gets my heart racing and my hands sweating... goosebumps. BTW - I love the little pics at the bottom of your blog so don't be surprised if I steal the idea and put it on my blog *tee hee* mine will have two little rascal boys though ... So Cute! I will try to catch it on tv! GO Maggie!!!! She rules! that is awesome! Have fun cheering her on this weekend! "the City". 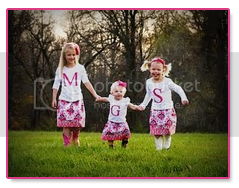 Enjoy your little girls those days are so fun & goes by way to quick. Tell Maggie she has a fan base of 6 just outsdide of NYC!! will wave to you in the bleachers tomorrow.